The National Testing Agency (NTA) has released the JEE Main 2019 examination notice on the official website. The registration process for both JEE Main 2019 and UGC NET 2018 will be held on NTA website, nta.ac.in. JEE Main 2019: The National Testing Agency (NTA), an autonomous organization under the Department of Higher Education, Ministry of Human Resource Development (HRD), Government of India, which has been established to conduct the competitive and entrance examinations, has released the JEE Main 2019 examination notice on the official website. According to the plans of NTA, the JEE (Main)-2019, the examination which is being conducted for the admission to engineering colleges and also as a screening test for the IIT JEE Advanced exam, will be conducted twice before admissions in the next academic session. The JEET Main registration will begin today along with UGC NET which is scheduled to be held in December this, the first exam being held in NTA's supervision after its establishment. As per the schedule, the NTA will conduct the first JEE (Main) exam in January 2019 for admission to Undergraduate Programs in NITs, IIITs and other Centrally Funded Technical Institutions etc. from January 6 to January 20, 2019. A candidate may appear in Paper 1 and/or Paper2 depending upon the courses the person wishes to pursue. All the candidates aspiring to take admission to the undergraduate programs at IlTs for the year 2019 will have to appear in the Paper-1 (B. E. /B. Tech.) of JEE Main 2019. Based on the performance in Paper-1 (B. E. /B. Tech.) of JEE Main 2019, a number of top candidates as per the requirement of JEE Advanced - including all categories - will be eligible to appear in JEE Advanced 2019. Admissions to Ills will be based only on category-wise All India Rank (AIR) in JEE Advanced, subject to conditions as defined in JEE Advanced 2019 rules. The second JEE Main April 2019 will be conducted from April 6 to April 20, 2019 for which a separate notice will be issued later on and the candidates will be required to apply separately. However, according to NTA, candidates are not required to compulsorily appear in both the tests i.e. JEE Main January 2019 and JEE Main April 2019. 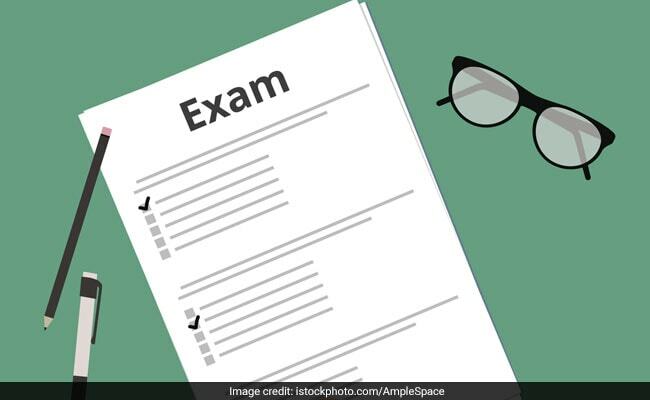 In case, a candidate appears in both the tests, the better of the two scores will be used for the admissions and eligibility for JEE Advanced 2019, said the NTA notice. 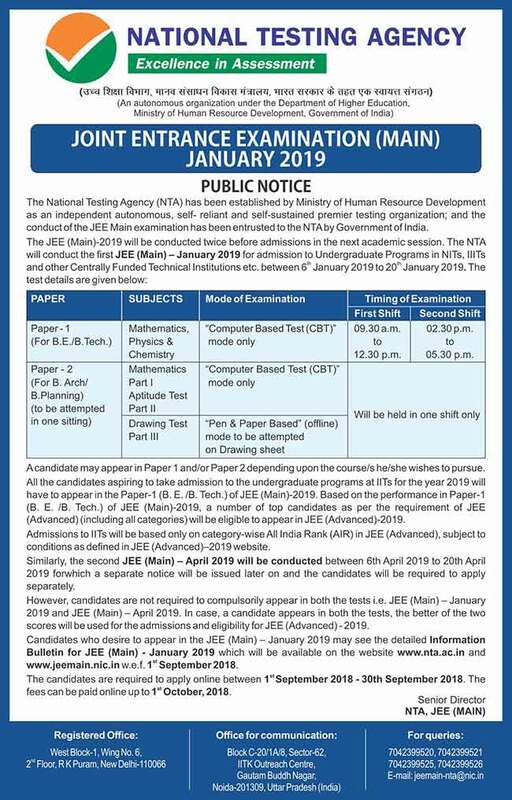 Candidates who desire to appear in the JEE Main January 2019 may see the detailed Information Bulletin for JEE Main January 2019 which will be available on the website www.nta.ac.in and www.jeemain.nic.in September 1, 2018. The candidates are required to apply online from September 1 to September 30, 2018. The fees can be paid online up to October 1, 2018.